Hillary Clinton Fundraising Violations? 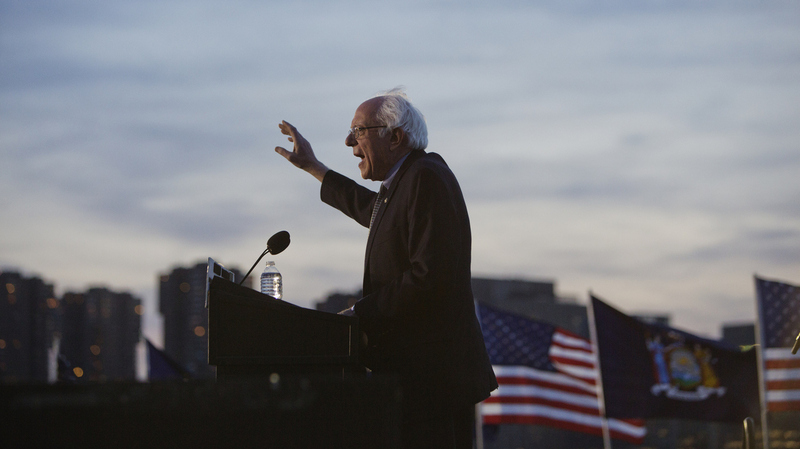 A Breakdown Of Bernie Sanders' Claims The Bernie Sanders campaign alleges that Hillary Clinton's campaign is running afoul of campaign finance law by using a joint fundraising committee with the Democratic National Committee. Democratic presidential candidate Bernie Sanders at a campaign event in Queens on Monday. Bernie Sanders' campaign is accusing the Hillary Victory Fund of "serious apparent violations" of the campaign finance law. The Hillary Victory Fund is a joint fundraising committee for the Clinton campaign, the Democratic National Committee and 32 state Democratic Party committees. Is this a fact-check? No. There's a shortage of facts here, since we can't see the books of the various committees. This appears to be a political attack more than a legal case. First, a word about joint fundraising committees. They're alliances of candidates and party political committees (or groups of candidates) to raise money together. A donor writes one check to the joint fundraising committee and the funds are divided up, according to the contribution limits. They're a regular part of presidential campaigning. Joint committees operate alongside the campaign and party committees, usually focusing on major donors. For the Hillary Victory Fund, the first $2,700 goes to Clinton's campaign, the next $33,400 to the DNC, and the rest in $10,000 bites to state committees. Events such as George Clooney's $353,400 fundraiser last weekend are where these checks are collected. What's the point of a presidential joint fundraising committee? To raise big-donor money beyond the reach of the campaign and to amass funds and build infrastructure for the general election contest. So far the Hillary Victory Fund has raised $60 million. Significantly, it is building its cash on hand to use down the road; that amount was $15.9 million on March 31. Moving on to the specifics. The claim: Hillary Victory Fund is raising some money exclusively for the Clinton campaign, not for the party committees. In a letter to DNC Chairwoman Debbie Wasserman Schultz, Sanders campaign lawyer Brad Deutsch says the Hillary Victory Fund has done small-donor fundraising that only benefits Clinton. The short answer: Joint fundraising committees can do that along with their big-donor fundraising. Beyond that, details are thin. The letter cites the Hillary Victory Fund's spending on direct-mail and online fundraising, "both of which appear to benefit only [the Clinton campaign]" because of the $2,700 contribution limit. But while mail and online pitches are aimed at small donors, they don't rule out people giving more than that. Clinton aides say the allegation is false; there are no data to contradict them. It's unknowable with the current Federal Election Commission disclosures alone. The claim: The letter says there are "serious concerns" that the joint committee is subsidizing the Clinton campaign in staff salaries and overhead. The short answer: We can't tell. The long answer: Somebody has to run the joint committee. Here, it's the Clinton campaign. The Sanders campaign points to $2.6 million in payments from the joint committee to the campaign, labeled as "salaries and overhead expenses." But there's no way of knowing exactly whose salaries and which overhead that's paying for. The letter is two pages, with assertions and broad totals, but no citations of specific transactions. From all visible records, the Hillary Victory Fund seems to be operating much like other joint committees. Again, this is a matter of politics, not law. If it were a legal complaint, the Sanders campaign would have gone to the Federal Election Commission, not the DNC. Then again, the FEC would deal with the complaint slowly, if at all. The small irony here is that Sanders has a joint fundraising committee too: Bernie Victory Fund. The DNC set it up for him last year when it established the Hillary Victory Fund. But the Bernie Victory Fund has remained dormant and Sanders has relied on his base of small donors instead. And just minutes after sending out the complaint to the DNC, the Sanders campaign sent out a fundraising letter to supporters citing the Clinton joint fundraising committee as a reason to give to Sanders.